Wondering where I have been…..Well it’s the most awaited time of the year – summer break geee 🙂 …..Yes a long break at the best place in the world…..right, mom’s. Doing nothing much other than gorging on mom’s delicious food. Though I missed my baking…did little bit for the kids, tried my hands on mango chutney and pickle, which turned out fairly well. 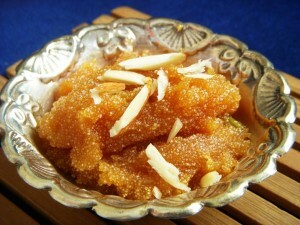 In last one month I tried three different variety of Sooji (Semolina) halwa. Each tasted different from the other and was absolutely scrumptious. 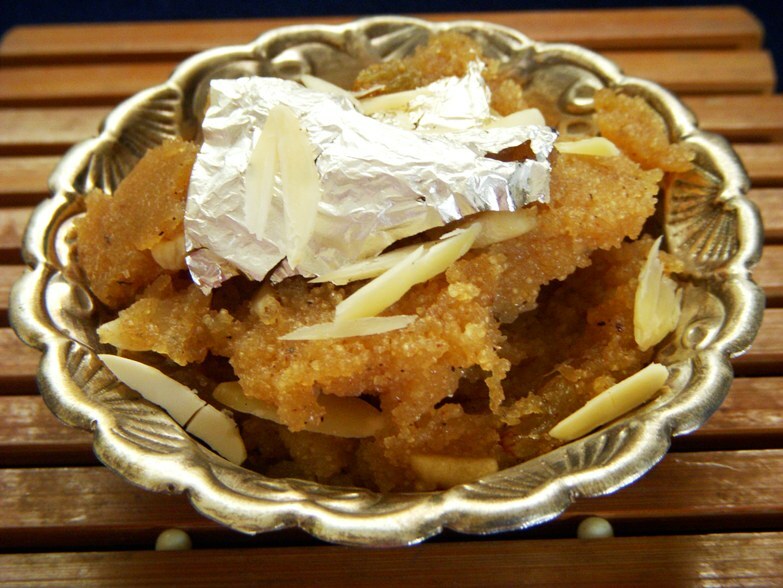 In a heavy bottomed pan, heat ghee and sugar together on medium to high flame, till the sugar caramelizes. Add water, cover it with the lid and remove it from the fire. After a minute remove the lid and stir to insure no lumps are formed then put it back on fire and cook till the water evaporates and it starts leaving the sides. The caramel halwa is ready. Transfer it to a serving bowl, carefully cover it with silver foil and sprinkle almond sliver on top. Mix sugar, semolina and milk in a bowl, and keep aside for two hours.